I had not heard the playing of the 25 year-old Augustin Hadelich prior to this disc although I see that he has recorded the Haydn concertos and Telemann Fantasias for Naxos. Although marketed by Avie records I see that the play and copyrights are held by the performer so this can be considered very much a calling card. And a very considerable one it is too. This is a very well planned and superbly executed disc of solo violin repertoire. With solo violin recitals in particular a certain kind of aural fatigue often sets in – no matter how remarkable the music-making and the technical excellence on display I find I suffer from virtuosity overkill. Not so here – for sure the exceptionally challenging programme is packed-full of enough technical challenges to make any but the very finest player blanch – but Hadelich is able to make the music the primary interest with the display element firmly in the service of the music. Hadelich contributes the warmly enthusiastic liner-note and explains that the Bartók Solo Sonata which opens the disc is also its centrepiece around which the rest of the programme was formed. He goes on to reveal that it is a work he has lived with for many years and that it was part of the programme for his Carnegie Hall debut. This deep knowledge of the score is revealed in a performance of total conviction, total technical control and profound musical insight. Hadelich alludes to the parallels the piece has with other works both by Bartók and other composers and the way it reflects “the horror of war [and] the sorrow of exile”. I quote Hadelich’s description because I think it is a perfect summation of a work of extraordinary power and intensely felt emotion – this is magnificent music-making and worth the entry price alone. The only mis-step I feel the programme makes is in the placing of three of the Paganini Caprices Op.1 immediately after the Bartók. I assume that the reasoning for their inclusion is because they are such staples of the virtuoso violinist’s repertoire. However, musically and emotionally it’s quite a lurch from the desolate beauty of Bartók to the party tricks of Paganini. Given that the rest of the programme is 20th Century might not the inclusion of the Prokofiev or Hindemith solo sonatas been a more interesting choice? Don’t get me wrong – Hadelich is able to toss off the Paganini with ease but that is just my point - this music does not have the intellectual/musical muscle of the remaining programme. As it happens I recently reviewed James Ehnes’ phenomenal recording of the complete Caprices and if I was being horribly picky I would have to say Hadelich does not have quite the same total technical ease as Ehnes superb though he is. But as soon as we reach the two Ysaye Sonatas for Solo Violin Op.27 he sounds immediately re-engaged. Again technical address is beyond reproach. What I particularly like though is the way that he builds the drama of these pieces as the works progress. To my mind the group of six sonatas are among the greatest works written for solo violin – Ysaye writes with such thorough understanding of the instrument that he creates an aural illusion of multiple parts playing. For many years my absolute favourite version of these works was that by Oscar Shumsky on Nimbus. Hadelich probably has the edge on Shumsky technically (although it should be noted that the Nimbus recording was from the early days of digital recording when editing was all but impossible so these are in effect “single take” performances) but there remains a stylish fluidity about Shumsky’s playing that reeks of class and experience. The greatest compliment I can pay Hadelich is that his playing reminds me of that late and great master. So to the final item on the programme; the Sonata for Solo Violin by Bernd Alois Zimmermann. To my shame I have to admit this is a work totally unknown by me. What a wonderful discovery it is too – compact and concentrated it lasts a mere nine minutes. Written in 1951 it packs three continuously played movements into its brief span. Don’t let the fact that the musical material is based on a serial tone-row put you off or that he writes (unlike Ysaye!) with little regard for what might or might not be possible on the violin. Hadelich again triumphs in presenting this as a compelling and thoroughly enjoyable work in its own right. Towards the end Zimmermann’s inclusion of a B-A-C-H motif neatly ties the whole programme back to the seminal works for solo violin by Bach from which all these other works ultimately have sprung. Another good example of the thoughtfulness of the programming here is how the first movement of the Bartók which opens the disc is a Chaconne. The last is the motivic allusion to Bach which gives the disc a pleasing symmetry. 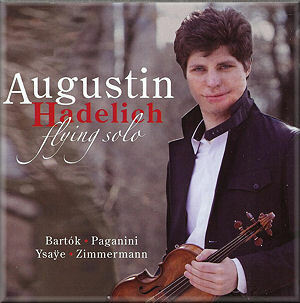 A brief word on the recording – Hadelich’s violin is closely miked (as seems to be the current preference) within a warm and resonant acoustic. His violin is the 1683 ex-Gingold Stradivarius and it does sound quite magnificent. I love the way Hadelich really digs into the strings – it is always said you really need to work a Strad hard to get the best results and that approach certainly pays dividends here. Recital discs can be problematic for collectors not wishing to duplicate repertoire. Given that all of the pieces here have been recorded elsewhere and that some might not wish to have “excerpts” from the Ysaye and Paganini complete works I could imagine this being passed over – don’t! As a concert/recital in its own right it works tremendously well. It also serves as an introduction to playing of considerable stature; it is a real privilege. I reiterate my statement about often suffering from virtuosity-fatigue – not so here. The music is the master and it is well served.